Why Is It Important that Someone on this Planet Understands the Geometry of a Circle? Article Summary: "Can you imagine how life would be different if all human beings were born with eight fingers instead of ten? Maybe our numbering system would be based on multiples of eight. A numbering system based upon eight exists and is called octal. Octal numbering is used behind the scenes in computer systems. " Home > Math Tips > Why Is It Important that Someone on this Planet Understands the Geometry of a Circle? Can you imagine what your world would be like without the wheel? Of course a wheel is a three-dimensional circle. The invention of the wheel is a key part of civilization, an invention as important as the discovery of how to make a fire for heating and cooking. Let's just think about the automobile and circles for a minute. Yes, the tires are round and so are the rims that the tires are mounted on. Did you ever think about the fact that someone must calculate the circumference of the tire rim in order to make a tire that fits the rim? Do you remember that the distance around the outside of a circle is called the circumference? The car manufacturer and the tire manufacturer have to work together to match tires to cars. Now let's think about the car's odometer which shows how many miles the car has been driven. Have you ever wondered how the miles on the odometer get calculated? The miles are computed from the number of times the tires go around which is called the number of revolutions. Each revolution of the tire adds an amount equal to the distance around the outside of the tire (the circumference) to the miles driven. When you service a car you frequently change the air filter. What is the shape of the common air filter? The air filter is also circular, made of two concentric circles. Concentric circles have the same center point. See how easily your geometry lessons translate to the real world! There are lots of other places in engineering where circles are important. Have you ever seen a Ferris wheel at an amusement part? Of course, a Ferris wheel is a giant circle that you can ride on. But this wheel helps you to think about other applications of circles like gears. Interlocking gears are used in all kinds of equipment and engines in factories everywhere. In fact interlocking gears, called the drivetrain, cause your car to move forward and backward. The exhaust pipe is round and hollow. Do you remember that in geometry the shape of the exhaust pipe is called a cylinder? Make a list of else on a car uses the idea of a circle. Circles are considered to be a perfect shape because every part of the circle is the same distance from the center point. A circle is often used in architecture due to its beauty. Can you think of any famous buildings that have circles as part of their architecture? 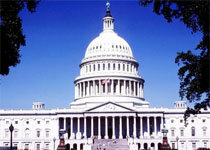 One famous building that should be familiar to you is the United States Capitol Building where the Congress meets. The dome at the top of the building features circles which make the building look elegant and impressive. The picture of the church is the world-renown Cathedral of Chartres which was built in the 12th century. The round stained glass window in the front of the cathedral is one of the most famous pieces of artwork in the world. The circle is seen a lot in nature. Many flowers are round and so are fruits like oranges. Have you ever dropped a stone or pebble into calm water and watched the concentric ripples float away? A long time ago people thought that the earth was perfectly round and that the planets made circular paths around the sun. Now we know that the planets orbit the sun in an elliptical rather than circular pattern. An ellipse is a geometric shape that looks like an oval. There certainly isn't just one answer to the question of why is it important that someone on this planet understands the geometry of a circle?